Bad planning. It was lunch time and we were in Plaza Mayor. The obvious thing to do was continue onwards to find somewhere the food wasn’t considered mediocre and overpriced. But it was actually way past lunchtime, seriously hot, stomachs were grumbling and we were fading fast after notching up a lot of urban kilometres. Plaza Mayor it was. We checked menu after menu, each one virtually identical. 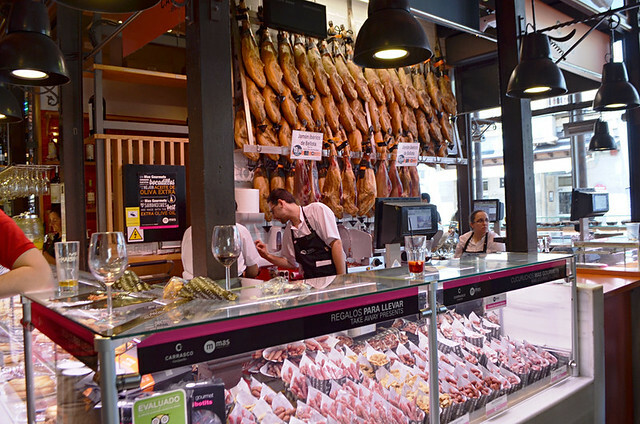 We live in Spain and had high expectations of finding food in Madrid that was different from the cuisine we’re used to. Plaza Mayor, beautiful though it was, didn’t come up with the goods. 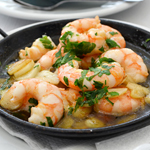 Out of desperation we picked Restaurant Hegar (Plaza Mayor 35; (+34) 913 667 691; open midday to midnight). The interior was slightly old fashioned, like a room my granny might have had especially for posh visitors. It was full of Spanish speaking diners; the couple at the table next to us knew the waiting staff which seemed a good sign. 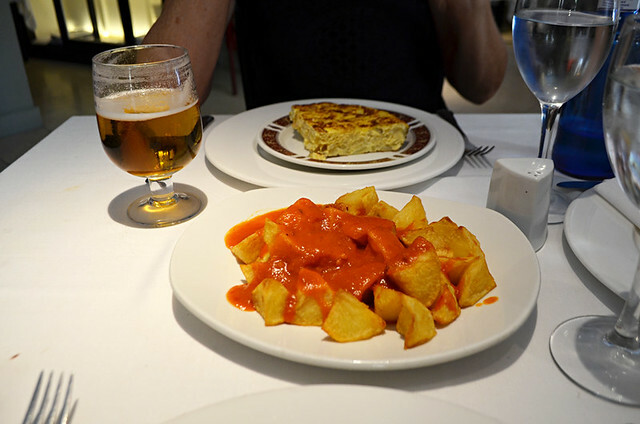 We ordered small fried fish, tortilla and papas bravas. As suspected, the food was only okay and overpriced. Two meals in Madrid. Neither had been memorable. Choosing where to eat in a city isn’t easy. ‘Research, research and research’ you cry. There are two problems with that when it comes to cities. Top 10 lists can feature excellent choices, but they tend to cover a huge area. Unless going out of your way to track restaurants down, one of the top 10s has to be close to the area you’re exploring just when it’s the right time to eat. 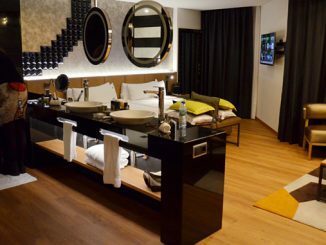 Where we chose to eat over five days and nights in Madrid was influenced more by circumstance and various criteria than the advice of a top 10 list. Lunch was anywhere which took our fancy close to wherever we happened to be. That’s a bit anarchic, but it’s the reality of deciding where to eat when hoofing it around a city during the day. There’s more control with dinner, although we wanted restaurants within relatively easy walking of our hotel on Plaza Santa Ana. 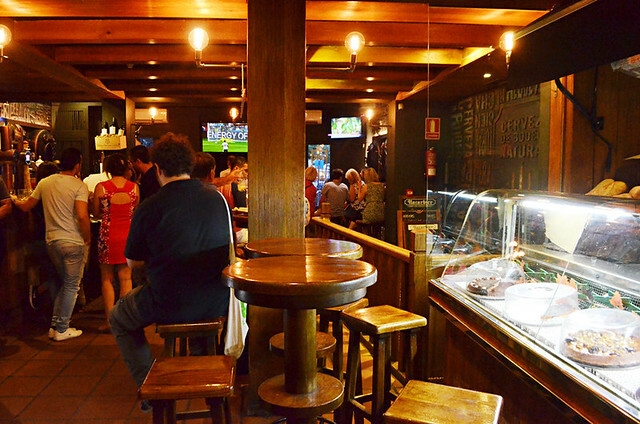 Our first tapas experience had been in Naturbier (Plaza Santa Ana 9; (+34) 913 600 597; open 10am to 1am). It was chosen because a) it was nearby b) it served traditional tapas and, most importantly, c) it screened World Cup matches and one was about to start. It was packed, the atmosphere was good, the waiter’s eye difficult to catch and the tapas of croquettes, tortillitas de camarones and German sausage with mash (it was the ‘mash’ which swung that one) were decent enough but nothing special. After 24 hours we’d sussed out menus and mapped our days better to include more of a culinary plan. For dinner on our second night, we didn’t stray beyond Plaza Santa Ana; the menu at funky Perico had perked our interest (Plaza Santa Ana 8; (+34) 914 298 630; open midday to midnight Sunday to Wednesday, midday to 2am Thursday to Saturday). 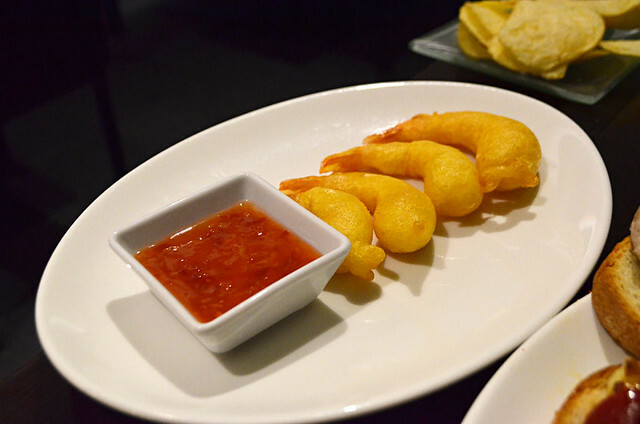 They’d changed their menu that day and were interested to know what we thought of their prawns in wasabi batter (tasty but light on wasabi flavour). A selection of pinchos (tuna and guacamole, cheese and red pepper, pork and caramelised onions) plus leek and cheese parcels followed by a chocolate soufflé were streets ahead in both the taste and creativity departments than the tapas we’d eaten up to that point. A route through Park Retiro the following day was timed so we arrived at the botanical gardens inside Atocha train station for lunch. 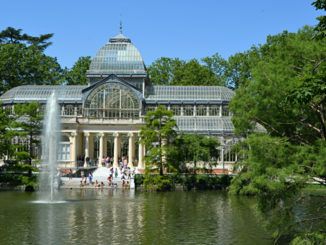 Not only did Atocha ignite childlike wonderment, it offered respite from the sun – a cool scene in more than one way. The Wine Plaza beside the terrapin pool was ideal for enjoying the gardens as well as mini gourmet hamburgers, goat’s cheese salad and a Spanish version of cheesecake. Saturday night saw the café society scene in Plaza Santa Ana swell to the point we struggled to find anywhere with a free table. We just managed to squeeze in at Lateral Santa Ana (Plaza Santa Ana 12; (+34) 91 420 15 82; open midday to midnight Sunday to Wednesday, midday to 2am Thursday to Saturday). When I say ‘squeeze in’ I mean it. The tables were so close together I could feel the heat from the sunburnt legs of a girl sitting to my right. The tapas were creative and tasty but plates of fried artichokes with ibérico shavings, vegetable tempura, chicken with truffled potato foam and bull’s tail with creamy potatoes came rapid fire one after another. Not quite the long, leisurely dining experience we’re used to. 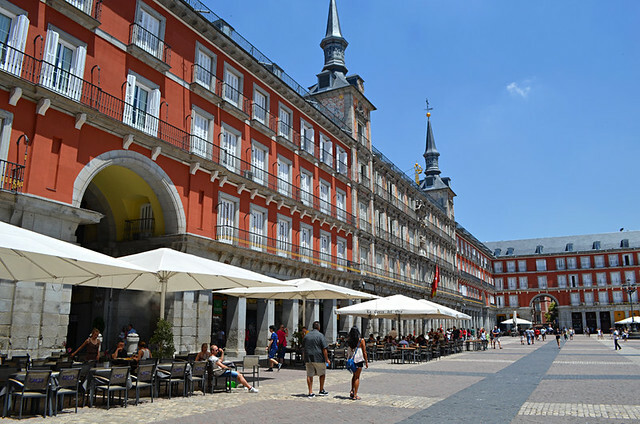 A tour of Madrid’s Sunday rastro in the streets around La Latino took us on a circuit which ended at the wrought iron frame of the Mercado de San Miguel (Plaza San Miguel; (+34) 915 424 936; open 10am to midnight Monday to Wednesday and Sunday, 10am to 2am Thursday to Saturday). 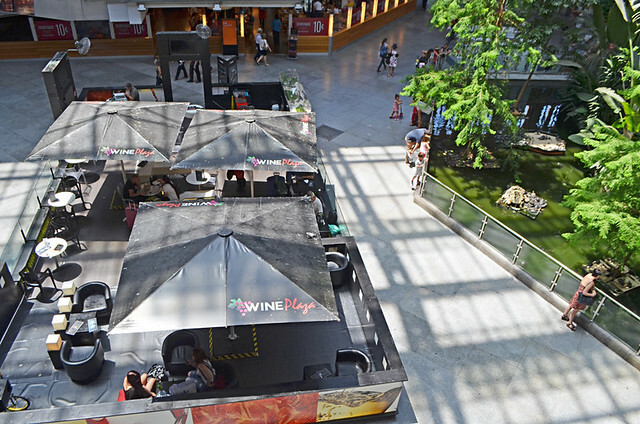 The collection of tapas, fish and seafood, cheese, pinchos, beer and wine stalls had us salivating. It was heaving, requiring an element of assertive shoulder charging to get close to the food. Eventually we managed to cobble together a motley culinary crew consisting of paella, pinchos morunos, mini wraps and a sea urchin, plus a couple of generous glasses of white wine from a mobile wine seller. A downside to the market when it’s so busy is there’s a lack of places to actually enjoy your tapas. We ate ours sitting like a pair of buskers on the steps at a side entrance. By Sunday night we fancied a break from tapas. 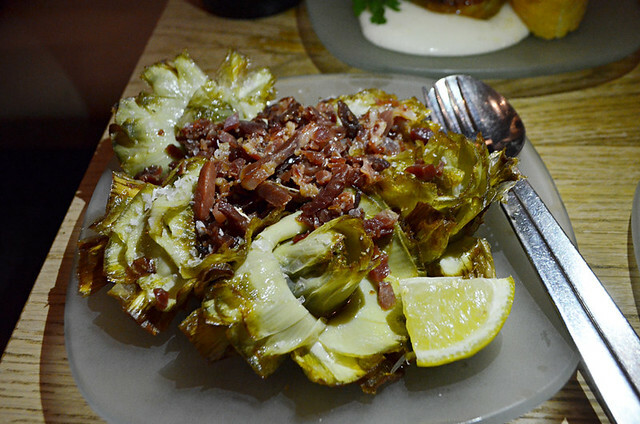 However, many menus featured dishes that were too hearty for summer temperatures. 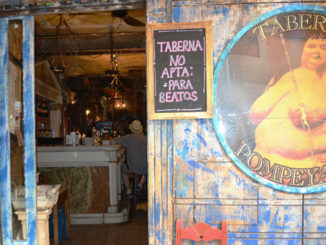 One restaurant which had lighter offerings was Lamucca de Prado (Calle Prado 16; (+34) 915 21 000 000; open 1pm to 1am Monday to Thursday, 1pm to 2am Friday to Sunday). 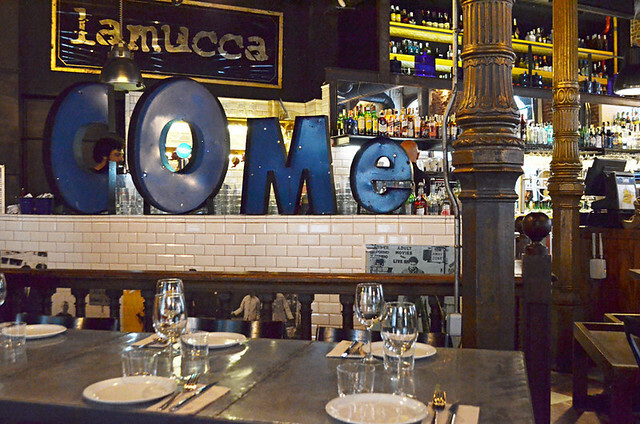 With five Lamucca restaurants in Madrid there’s a chain feel to the place, but the décor is attractively stylish and the menu different enough to be interesting. After a Middle Eastern starter of hummus and baba ganoush I had a morcilla and goat’s cheese pizza, a combination which worked for me. It was a good pizza. A big breakfast meant no lunch stop on our final day. After spotting restaurant Patong Thai during our explore of the streets around Plaza Santa Ana, we’d developed a yen for Thai food (Calle de la Cruz 7; (+34) 911882 736; open midday to 4.30pm and 8pm to midnight). 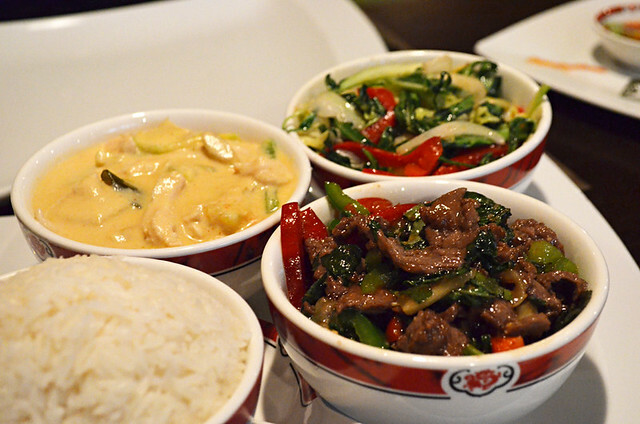 Prices were reasonable and a taster menu of dishes meant we were able to satisfy our lust with a range of deliciously perfumed Thai dishes. 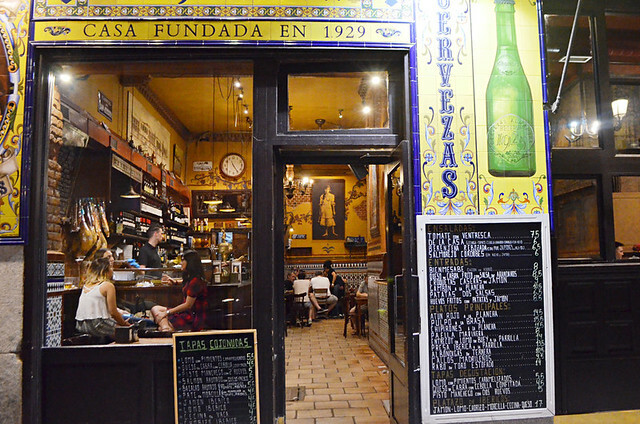 It might seem a crime to pass up on all those atmospheric Madrid tapas bars with their hanging jamóns and painted tiled entrances in favour in contemporary restaurants and cuisine from other countries. But here’s the thing. After dinner we like a couple to drinks to finish off the evening. Guess where we chose to do that? That, my friends, is called enjoying the best of both worlds.